Sen. James Lankford (R-OK) has introduced a bill that would set standards for how federal agencies consider scientific findings when developing regulations. At a hearing he convened on the subject, he called for increased transparency and accessibility of scientific inputs to regulatory decisions. 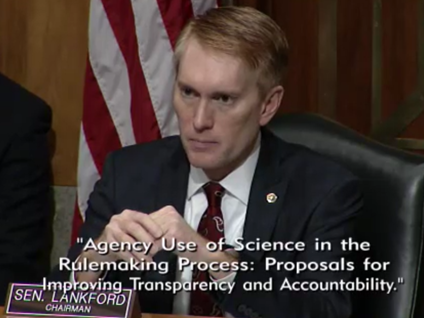 Sen. James Lankford (R-OK) chairs a Regulatory Affairs and Federal Management Subcommittee hearing. Unlike the “HONEST Act,” Lankford’s bill does not contain a clause that requires research data, models, and methods underpinning regulatory decisions be made “publicly available online in a manner that is sufficient for independent analysis and substantial reproduction of research results.” However, his comments and questions at the hearing made clear that he is interested in increasing public access to such items. Proponents of the bills argue that their proposed requirements are consistent with the spirit of past executive actions relevant to research transparency, such as President Obama’s 2009 memorandum on scientific integrity and the White House Office of Science and Technology Policy’s 2013 directive on increasing accessibility of federally funded research results. In his opening statement at the March 9 hearing, Lankford said that when assessing whether scientific information is the “best available,” agencies should consider whether the “conclusions are verifiable and reproducible” and whether the “data is transparent and publicly available,” among other considerations. He then criticized the inaccessibility of data used to inform major regulations, alluding to the so-called “Six Cities Study,” a landmark paper in which Harvard researchers reported an association between air quality and mortality rates. “When many of the most costly Clean Air Act regulations are based on a single Harvard study, the EPA should not be able to hide behind the excuse that they can’t release the study because they don’t own it, Harvard does, despite the fact that Harvard receives well over a half of a billion dollars in federal awards,” he remarked. “Examples like these call into question whether agencies are actually using the best information available to them when they make regulatory decisions,” he added. The Harvard paper has become a focal point in debates over how to balance public access with safeguards for private information as well as whether the government is able to compel the release of data collected as a part of federally funded research projects. House Science Committee Chairman Lamar Smith (R-TX), the sponsor of the “HONEST Act,” attempted to subpoena data from the study in 2013. Rep. Eddie Bernice Johnson (D-TX), the committee’s ranking member, has asserted Smith’s interest in sponsoring the legislation stems from his inability to gain access to the study data. In written testimony submitted for Lankford’s hearing, Andrew Rosenberg, director of the Union of Concerned Scientists Center for Science and Democracy, said that the Harvard study has become politicized. He disputed the unique importance EPA's critics ascribe to the study, saying it is one of many that underpin EPA's particulate matter regulations. He also pointed out that it already has been reanalyzed by independent researchers. The witnesses offered divergent views on whether requiring access to raw data is warranted or wise. Nancy Beck, a senior director for regulatory science policy at the American Chemistry Council, argued that greater transparency is needed in order to restore public trust in science, which she said has eroded in recent years due to prominent media reports about reproducibility issues. “If you want to have trust and confidence in your regulatory decisions, you need to be as transparent as you can absolutely be about that underlying data so that everyone is on the same page and can have a scientific dialogue,” she remarked. Susan Dudley, director of George Washington University’s Regulatory Studies Center, recommended that greater weight be placed on studies that are reproducible. She also pointed to steps the journal Science has taken to make the research data underlying articles more accessible. Both Beck and Dudley also said that there are viable frameworks for sharing data in ways that protect personal and proprietary information. Rosenberg argued that making such data available is often unnecessary to conduct peer review. He described how when he serves as a peer reviewer, he assesses the data collection and modeling processes rather than the raw data itself. Requiring such data be made available could lead to a “process of review with almost no end,” he cautioned, and urged the panel to be “realistic” in its efforts to increase transparency. An alternate way to strengthen the integrity of the process, Rosenberg said, would be to maintain strong conflict of interest and scientific integrity policies across government, pointing to introduction of the “Scientific Integrity Act” in both chambers of Congress as a positive development. Lankford acknowledged a need to balance public access with protections for personal and proprietary information, but also implied that the protections for federally funded research need not necessarily be the same. “We obviously want people to be able to do their research, to be able to protect their data. They paid for it, they worked through the process — unless it’s the federal taxpayer that paid for it, and that’s a whole different set of issues,” he said, without elaborating. He also expressed confidence in being able to find a solution that would adequately protect private information, noting that the Senate Intelligence Committee on which he serves often deals with heavily redacted information.